" A poetess with magical dreams"
The beauty of life is an embodiment of love, loss, heartbreaks and other emotions that we encounter in our journey that defines us aptly and perfectly to the core. One such journey with many twists and turns is of Ms.Preneeja Peelukhana, a bubbly and effervescent personality who has defied all odds of life by her resilient and tenacious attitude and emerged unscathed as a clear cut winner. She is a person who is clothed in strength and always smiles without the fear of the future. My heart swells with pride speaking about the multifaceted personality who has many coveted titles attached to her cap of fame. Ms.Preneeja Peelukhana, 26 years old from the city of Hyderabad, an Organizational Psychologist by profession and a Freelance Mentor, Trainer, Counsellor. A World Record Holder as “The Youngest Psychologist Author”. 1.Please tell us about yourself. B +ve and so, optimism is my key. I strive to justify my life by being a human in real sense and see humanity as my religion. And this is the reason for all my volunteering works and my inclination towards the needy especially children. The hundreds of kids in various orphanages who found their family in me and all my students, they complete me. I’m and shall be a healer and I look forward to be a life coach, a home to all those who lost their paths. 2.Have you always known that you wanted to be a writer? What inspired your debut? I believe that words are the best form of expression. For the observant I am and the ever-talking nature of mine carved me into a story teller. I’m fortunate enough to bag in a vast collection of stories within through self-experiences and some by being an active listener and lending my ears to hundreds of people. I always have an urge to share these stories, share the experiences, share all that I learn and writing is one of the mediums that helps me in doing so, it gives me pleasure. Many say that the voice of my scribbled words is very loud and it helps me in connecting to various people. I care about what I do more than what it brings to me and that according to me is the special ink that makes my work create a field around the readers which makes them fall harder for me each time they read it. 3.What kind of research do you do, and where do you get ideas from. Frankly, never till now I needed any research to deliver any literary piece of mine. I’m a non-fictional writer and love to have my feet rooted in reality. I like to pick the thoughts of my hyperactive mind and spill down stories which I felt, feel, experience and connect to. I only wish to show the mirror, give reality checks to others and myself. Through my poetry and other literary works, readers, along with the standard laughs and tears, can expect a sneak peek into how the neurons that power my brain work to produce content that is more addictive than nicotine and jalebis put together. Readers can expect a gravity-esque pull back to the book which only gets better with every re-read of the book. I convert into the letters of the alphabet the things that happen around me, both positive and negative, each bringing with them a different perspective of life. I am a psychologist by profession and writing is another medium for me to enable my readers to find the answers they’re looking for. I’m a believer of perceptions & connections, how far they connect depends on our shared perception. 4.How long do you spend researching before beginning a book? Like I said, haven’t had a need to do a research for my debut book and what happens in future is certainly unknown to me. The only chunks of time I buy before writing anything is to sculp my thoughts in a way that I share them with a different perspective with the garnish of positivity. 5.What is the most difficult part of your artistic process that has challenged you? Well, every smile, every person, every tear and life as whole is fascinating. It serves as an inspiration for me in activities I do; be it poetry, writing, projects, campaigns, art & craft or in general conversations. I find it beautiful to dig down into the depth of emotions and live them completely of mine as well of others. For the little obsession that I carry to live, smile & make lives, every story shared to me both personally & professionally has driven me further to explore the universe. And the most challenging part of all these is to stay constant, to stay grounded and channelize my thoughts rightly and maintain a healthy emotional intelligence. 6. Who are some authors in your genre that inspires you? The only name that is engraved in my core which answers this question is John Donne. He is the poet who consciously or unconsciously has an impact on me. He is a metaphysical poet and his poem ‘The Canonization’ made me fall in awe for years now. Other than this, ‘The Brook’ by Alfred Lord Tennyson, especially the last two lines of it ‘For men may come and men may go, But I go on for ever’ became my chant for raising up after every fall and helped me learn the art of letting go. Wole Soyinka’s ‘The Telephone Conversation’ taught me how not to judge people and the importance of humanity. Another poem that knowingly or unknowingly moulded me into the person I’m is ‘The Road Not Taken’ by Robert Frost. 7. Take us through your experiences as an author. I find the current reading audience similar to me. Interest, curiosity, depth, silence and untamed minds find their way to read, write & unite. Frankly, any form of art falls into the same criteria. The current reading audience according to me is the best critic and vastly wise. Not easy to please them as they are developing day by day into the soul searchers and life tuners and of course, the sole reason for existence and development of any writer. So, with every bit of my work and every word I write, I make sure I’m transparent. More than an author, I wish to call myself as a story teller set on a journey to reform, inspire and heal the world. 8. What’s coming next for you? For being a non-fictional writer, I’m simultaneously working on two projects, both of them are anthologies which capture the ignored side of the society and the outcomes of cognitive errors that occur to us humans. To mention, there isn’t any plan of quitting writing! 9. Can you tell us a bit about the book? My book ‘An Anonymous Soul’ is a poetry anthology of ‘her’ feelings & flooded emotions. It’s her quora – the questions she had & the answers she seeked, the stories she had & the escape she seeked in various situations with various people. The forced silence on the most talkative soul hooked her to writing. To the one giving therapies to several, scribbling became the light at the end of a tunnel, it became her therapy. The congested thoughts and avoided conversations jammed in her mind paved a way to papers leaving her in contentment and calmness under the humongous waves of judgements and a gust of disapprovals in the ocean of people. Experience the swirl as you immerse into the whirlpool of an ordinary girl’s mind and indulge into the depth of her experiences as she tries to rhyme! 10. Finally, if you could pass on a single piece of advice to authors out there reading this interview, what would it be. Advise? Well, all I would say is ‘BE REAL’. Words work wonders and as they say, a pen is more powerful than a sword, it would be great if the talent of writing is used rightly. been zealous, enthusiastic, creative and had a penchant for writing. I am delighted to learn that she has brought out her debut book “An Anonymous Soul”, Preneeja P has been a bubbly girl who took a leading role in the activities at school and outside school portals as well. Many a times we had a discussion on the contemporary issues and I am glad to be her mentor. new heights in her journey of literary life! I wish her all the best. May God bless you. 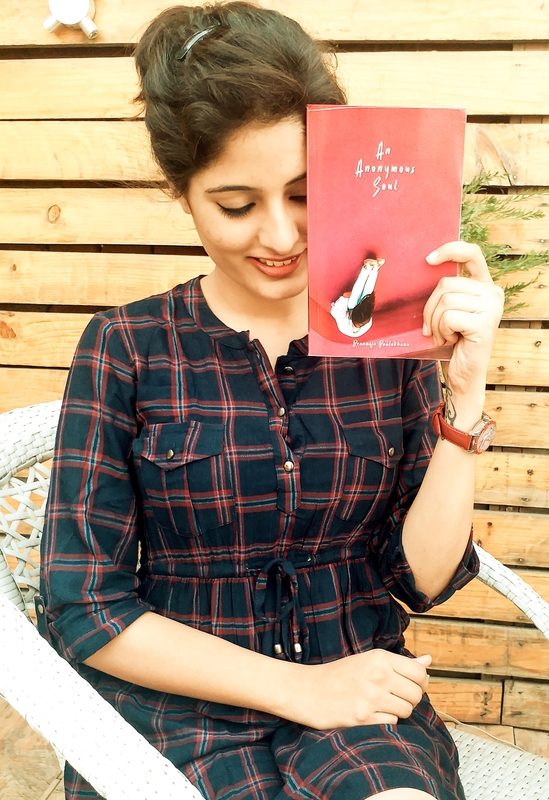 Young and dynamic Psychologist Preneeja has ventured into the best art of poetry with the touch of psychology. Her insights are true guidelines for all people who would choose to think in righteous way. Her insights provide lots of values and beliefs that our parents and society instil in us that relate to individual life. This I-want-to-change-the-world girl has come to the lime light today where the world claims her to be the youngest psychologist-author. But her psychological- philanthropical ways predates this. Her immense strong mind with gentle heart, probably explains her strong empathetic abilities. There will be definitely a day when her methods keep shaping up this world. All the best. Preneeja Di, my soul sister, guider, inspiration. A kind-hearted person, you talk to her once and then you can never stop talking. She is like a backbone, always there at any time irrespective of her busy schedule. Ups and downs in her life, never broke her down instead she is just flying higher by just fighting through everything that comes her way and that’s how she is an inspiration to me. She is one of the authors that someone dies to read because of the way she writes with deep emotional touch connects to us somewhere. On whole, she is blend of so many beautiful things that can’t be expressed in one go. I feel glad to testify for Preneeja (youngest psychologist author), The book named “An Anonymous Soul”. The book title defines the personality of the author. It starts with beautiful short little poems which leads you to a land of knowing her life journey. I don’t know how to start. I really can’t count how many poems I liked. Maybe me reading the book helped me know her better. Her book perfectly depicts her journey of life. It really sounds like it is her who is reading all those very loudly. Yeah! I may run out of words. But I may not run out of complimenting the art and effort she made towards completing the book. Preneeja, previously it was like “yeah! You’re my senior, we shared same school.” But your book changed it. Now I can say I know you a bit.. I am Pretty glad for that. How can I forget our first meet was in the washroom. Again sharing same college. We see it when young people break away from living and breathing social groups to snap a selfie… and then that is where she started to discover herself. But I must say the very cute note you wrote for your loved one [P.S] is soo adorable. From page 1 till the end. I just wonder how it feels to that person to know that the courage you showed to write for that person. Your midnight scribblings they are more, the way you expressed each particular day. They are literally like the summary of a day, the way you spent the new things you learnt. The experiences you gained. Cute little things were the take way from those scribblings. Every page had a take away experience. Thank you for being always there, a friend where I can go and approach her any time. Last but not the least I wish you best of luck for all the achievements you received and for your life. There are very few people who speak their hearts out without any inhibition. Preneeja is one of them. An Anonymous Soul is a magnificent book and very exquisite creation of a young talent, a young author Ms Preneeja Peelukhana, who has a glorious style of expressing her feelings in a very thought-provoking manner. Her judgmental selection of words and command towards the language makes her even more unique from other authors. It’s really very appreciable that at this age she has written a glorious book with a splendid content in it. Her exclusive way of expressing her flooded emotions makes her more special and innovative. Apart from that she is a very humble and scholastic human I’ve ever seen and really admire her a lot and lot. I hope she will really succeed in life and remain as an inspiration to everyone. An Anonymous Soul is a combination of emotions and journey of the very amazing Preneeja. Her struggle did not stop her from living a life, rarely lived by anyone else. Holding a bring smile on her face, she narrated her life from her struggles to her ambitious dreams with a simple, crisp and emotional journey. Preneeja inspires me. She makes an excellent writer, storyteller and a management professional. Her ambitious dreams and her way of solving her crisis is a story in itself. Read it to Feel it !!! I still remember our first meet. We both just got connected like magnets as if we knew each other from very long just like a lost puppy(me) got back to his loving master. Your book is also as warm as a welcoming warm home for a homeless in cold winters.. Just like a warm hug is given to a cold person who got frozen because of the cruel world and save him/her by melting him/her before turning into permanently walking dead. I am glad I met u my anonymous soul..
My hardest times where I faced in my life with toughest moments you were there to help me out of it at any time, you were guiding me the best to come out depression were no one could help me out, you are the best psychologist for me to motivate me and giving me suggestions to help me to come out of it ! Thank you Preneeja for being there all the time! “We all have a story to tell! ” This statement got a new meaning when I first met Preneeja. Not your ordinary psychologist, she doesn’t preach the theoretical knowledge but makes an active attempt to connect with the person, even through her writings. This makes her unique and rationally sound in her arguments. I thoroughly enjoyed reading her and will recommend to anyone with an inclination towards genuine reading experience. The most active, creative and inspiring artist on the block. A great story teller and most importantly an amazing person. A beautiful collection of thoughts weaved together to define variations of emotions and life. Well versed and very well expressed. A must read collection to get a deeper connect or to see a different perspective. Raw, Intense, Beautiful- this three words define her writings perfectly. Reading this book was like an emotional ride. I could really connect with the words on a personal level. which talk about survival and give strength to its readers. first you remember your wounds and then you remember that you can heal. Her words are filled with love. Her smile is infectious, her care is timeless for her loved ones. She strikes honesty very beautifully. I am glad to have met such a hard-working and passionate women!! Luck and love to you always, Preneeja!! As I write this testimonial, I would like to say Preneeja as a writer and as person fits in the lines below: ” A writer is a person who is not only aware of one’s own heart but of all who come in contact.” Knowing her as my student, she was determined in whatever she did regardless of the hurdles that came her way. She has successfully transformed those hurdles as her stepping stone to success. Wishing her the best as she has become the voice of the voiceless and a friend to many. Preneeja’s writings are simple to read and understand but they take you to deep thinking and retrospection. It leads us to reflect deeply about our very own life experiences as some of them are totally relatable. I highly recommend reading “An Anonymous Soul”!! Preneeja Di! She is one of the most beautiful people I have known and her beauty lies in her writings. When I came to know about her world record holding book “An Anonymous Soul” and after reading her writings the first word which came into my head was “Star Girl” and when I met her personally, I attracted positive vibes from her which she spreads wherever she goes along with her bright smile, she is very charming, beautiful, full of life and a lady with a huge heart! Her writings are worth reading, love the way she writes! So far, she has been an inspiration to me. Preneeja is a very passionate and wholehearted writer. Her writings manifest a great deal of positivity. The way she writes about happiness, love, relationships, ups and downs of life is beautiful. Her writings are so uncomplicated and pertinent with our daily lives, which makes it much more interesting. As she was my senior, I was lucky to know her personally. On a particular day she was writing the story of Balwinder and she didn’t sleep till 3am to complete the story, which shows her passion and dedication towards her work. Also, she is very kind and empathetic human being, who loves spending time at orphanages and kids. Last but not the least she is World Record holder for being Youngest Psychologist Author, which is very inspiring. You write soo deep, yet very clear. The way you express makes me smile, learn, inspire and sometimes make my eyes wet too! Keep writing I would love to read more and more. Preneeja, isn’t she a wonderful soul. I was never a book lover, always felt bored reading first few pages of any book as they failed to pull my attention onto them. Oh yeah but this book ‘An Anonymous Soul’ just grabbed my attention all the way till I completed the book. At such a young age she has achieved so much by writing this book. This book literally tells you what all a woman has to go. She was just extraordinary with her writing, I had to fall for her. I also feel jealous sometimes seeing the vocabulary she uses, wish I had that talent. She is always there for her friends and students. I also happen to read what she had written to support her student Balvinder Singh, that act was phenomenal. When you have such a support system behind you, I think no disease can hit you. And yes Preneeja, you are a beautiful soul. An anonymous soul is the taste of originality with the quality, with no extra added stuff but, the presence of real flavour, beautifully written emotional and strong poems are worth reading. This interesting book take one’s heart away, and leave the reader continuously wanting for more. There’s absolutely nothing not to love about this book. The cover and the title of the book are very well suited with the poetry inside. It is the experience of violence, abuse, love, loss and relationships. Exquisite book with so many interesting poems! At last, Raw, intense and beautiful – this cuts right through your heart! A must read for all the poetry lovers. Writing is something straight out of heart which you have mastered beautifully in this book, weaving the experiences and imaginations together, this book is a piece of art.